A conjunction of the triple moons opens a pylon with a doorway to Earth. This is the first time the Marshalls appear to be sleeping without their shoes on. They are still fully clothed otherwise (although they do make the concession of sleeping with their shirts untucked). When they are awoken by chanting in the middle of the night, Rick and Will comment that it sounds like the Paku. They should have said "Pakuni", the plural of Paku. 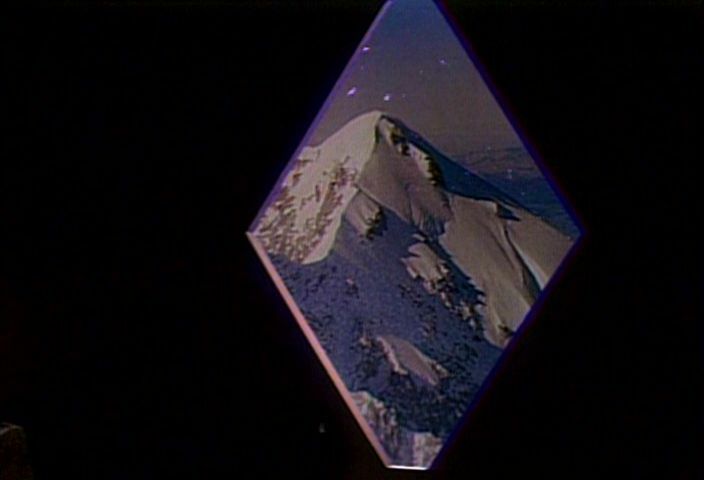 At 4:22 on the DVD, we see that the sun seems to rise instantly. Is this always the case in the Land of the Lost? 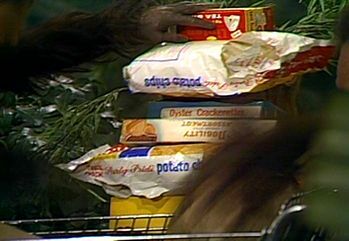 Ta throws one squash into the pylon/time-doorway and gets several grocery bags worth of packaged Earth food back. But how does that conform to the Land's law of conservation of matter as stated by Enik in "Circle", that for one object to enter the Land an object of equal mass must leave? Ta throws a second squash in and the pylon door closes immediately after. But the door doesn't close when first Rick walks inside and then Will. Ta does it again later when Holly walks inside. Did Ta just know precisely when it would close again and wanted it to appear as if he had done it? If so, Ta makes himself look like a real jerk, trapping the humans inside! He even seems to congratulate himself after sealing Holly in. During Ta and Cha-ka's argument outside the pylon, Sa seems to be playfully rolling a squash around on the ground! I guess she's easily entertained! It's an amusing scene, the one with the Pakuni laboriously carrying the shopping cart full of goods. But, the Pakuni seem to be intelligent enough to be able to use/recognize wheels, don't you think? Of course, Ta does figure it out eventually (and uses it as a chariot! ), but it seems like it would happen sooner. 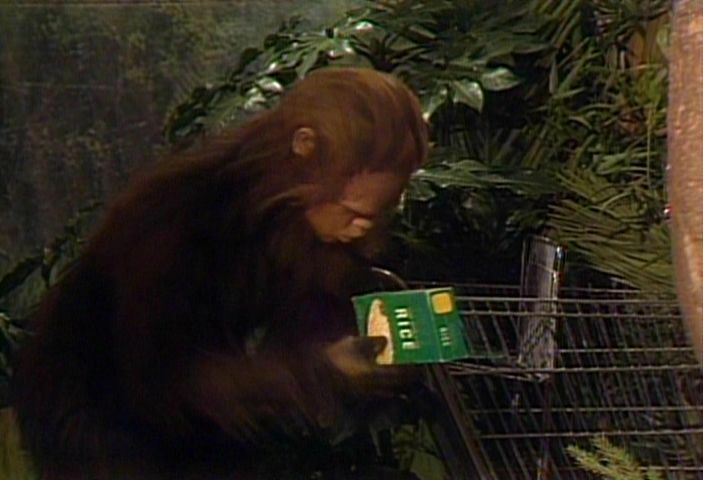 What kind of food companies serve the Land of the Lost? 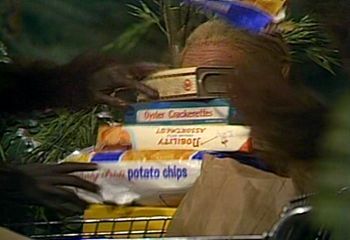 Well, from the screen grabs below, we can see Family Pride Potato Chips (looks like a Laura Scudder's bag of the '70s), Nobility brand cookie assortment, some Oyster Crackerettes (no brand visible, possibly Sunshine brand), a can of powdered mix of some type (Hershey's Cocoa? ), a box of tea bags that is obviously Lipton but with the name covered up with a red strip (you can still read through the strip though in the picture), a "Candy" bar (looks like a disguised Mounds bar by the Peter Paul company), a box of rice (no brand visible but it appears that the brand name was covered up with a green strip; Rice-A-Roni?). Notice also that the two potato chip bags are already torn open! Will also mentions a can-opener, soap, raisins, and cheese. 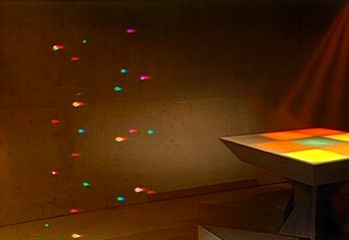 The lights and sound as Holly is transported on her journey are very similar to those seen and heard when Builder arrives in the Temple in "Musician". Does this indicate that the Builders are responsible for the pylons? And yet, the Marshalls see and hear an Altrusian as the Possessor in the episode "The Possession". 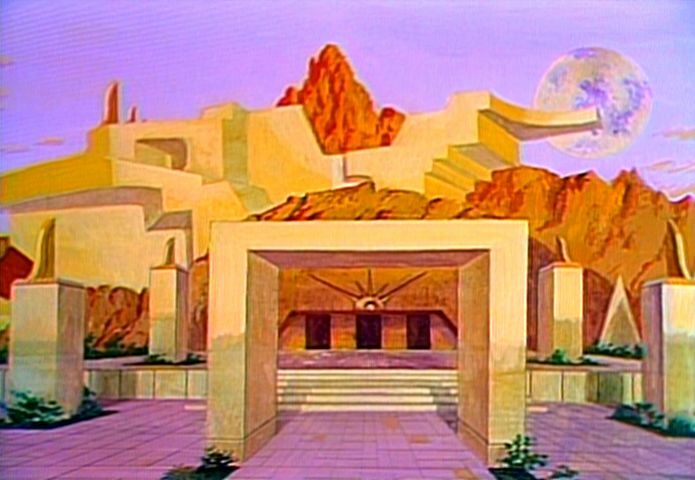 The images of the Lost City when it was still at the height of Altrusian splendor are nothing more than colored drawings! (See Images from the Time Doorway below.) I guess it would have been awfully expensive to build an entire miniature of the intact city. At 20:41 on the DVD, as the bouncing box is, uh, bouncing, you can see the shadow of the puppeteering device that holds the strings bouncing up and down as well. The giant vacuum cleaner device that Holly sees on her journey is even bigger than I ever noticed. At 21:18 on the DVD, you can see that the hose-like body of it snakes into the distance behind the head, disappearing into the boulders beyond. On that same world it also appears there may be buildings in the background; some rectangular features stick up past the boulders. Odd how the people in the park don't seem to notice that a pylon has suddenly appeared in their midst! 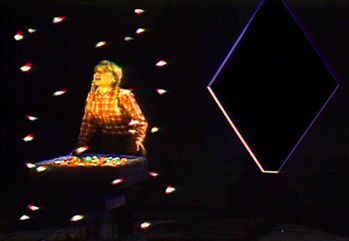 Perhaps it was invisible to them, like the pylon in the third season episode "The Orb"? Is this the first time we've heard Rick Marshall threaten violence against another sentient being? I think so! Listen: It better be now. This is the first time we see the smallest of the triple moons, the one Rick calls Speedy in this episode, orbiting at its one minute interval; it was always shown in a slow, stable orbit in previous episodes. What happened to change it? And actually, if you watch closely, you can see that the middle-sized moon is also moving at an accelerated rate, though not as fast as Speedy. 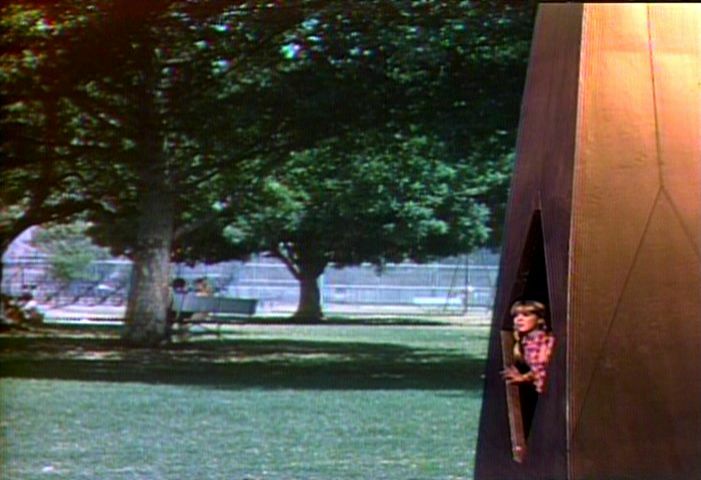 Is the pylon in this episode the same one Will and Holly discovered in LOTL's very first episode, "Cha-ka"? 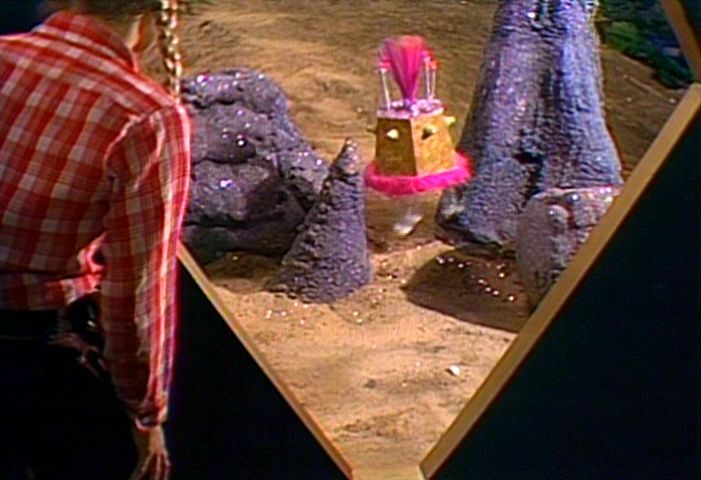 The pylon in this episode has no key; the one in "Cha-ka" did not appear to have one either. Why is there no key on the time-doorway pylon? Did someone take it? 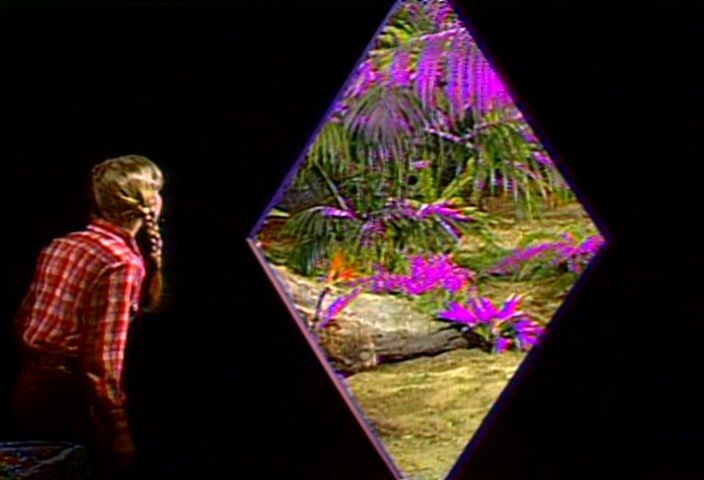 In "Elsewhen" the Marshalls see two triangular objects that look just like the pylon keys stuck on the walls in the Lost City; could one of those have been the key to this pylon? For that matter are the keys each specific to one pylon? Have the Marshalls ever tried interchanging the keys? 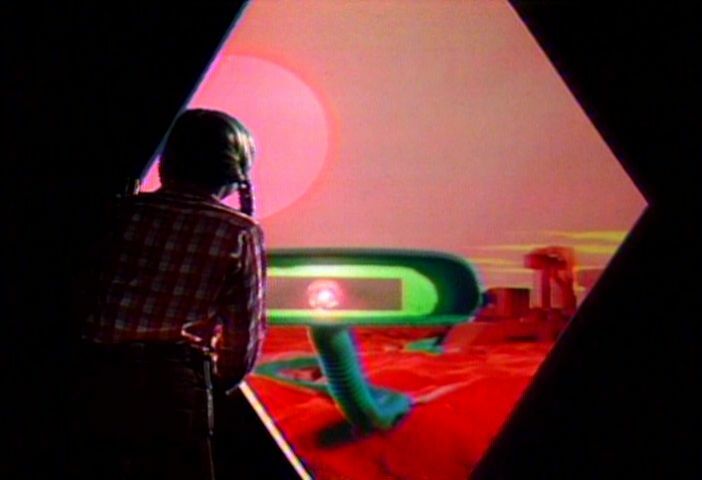 Here are screen grabs of the five worlds/times Holly sees during her journey on the Pylon Express. Click on the thumbnails to see a larger image. 4:32 Ta says, "Chiri." "Quiet." 5:50 Cha-ka says, "Wirra! Anu! Anu!" "Will! No! No!" 6:04 Cha-ka says, "Anu! Anu! Ee Paku yumani! Ego aguga?" "No! No! (Ee) Paku humans! Where (aguga)?" "Ee" and "aguga" are not in any known glossary. 6:09 Ta says, "Anu." "No." 6:19 Ta says, "Anu. Ta fo. Yeni fa onami." "No. Ta (fo). You take food." "Fo" is not in any known glossary. 6:27 Ta says, "Anu! Anu!" "No! No!" 7:04 Cha-ka says, "Bimisasa." "Very mannish." 7:07 Ta says, "Cha-ka abunisa." "Cha-ka very childish." 7:09 Cha-ka says, "Cha-ka de Wirra, Ari." "Cha-ka do Will, Holly." Gulp. 7:15 Cha-ka says, "Bimisasa." "Very mannish." 7:40 Ta says, "Fusachi." "Quickly." 7:50 Ta says, "Sa! Cha-ka! Yeni ba ego aguga!" "Sa! Cha-ka! You come (here?)!" 8:32 Ta says, "Yeni bako onami." "You bring food." 8:36 Ta says, "Yeni ku! Ku! Ku! Yeni ku!" "You go! Go! Go! You go!" 8:40 Ta says, "Anu Ari. Yeni ku, yeni ku." "No Holly. You go, you go." 8:46 Ta says, "Ye ku." "You go." 8:48 Sa says, "Cha-ka ku..." "Cha-ka go..."
9:42 Sa says, "Ani me (muffled words)." me=I, "ani" is unknown. 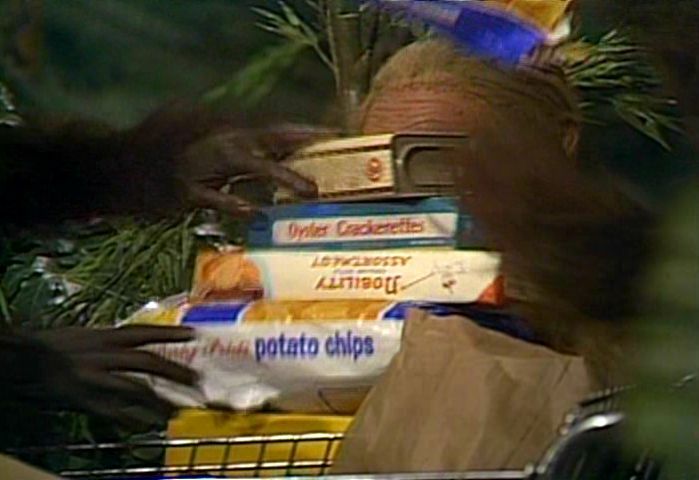 These and some other words are muffled by the stack of groceries she holds in front of her. 9:45 Cha-ka says, "Etoda. Etoda." "Etoda" is not in any known glossary. 10:50 Holly says, "Me tobi ye, amura." "I greet you, friend." 10:53 Cha-ka says, "Me tobi ye, amura." "I greet you, friend." 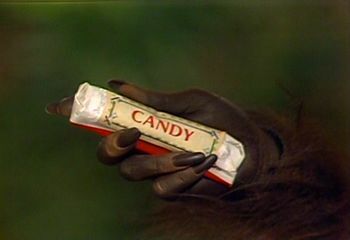 10:58 Holly says, "Wu ye Rica o Wirra?" "You see Rick or Will?" 11:00 Cha-ka says, "Me nanda." "I'm sorry." 11:05 Holly says, "Wu ye wani?" "You saw them?" 11:07 Cha-ka says, "Yooo." "Yes." 11:11 Holly says, "Sa ego wani?" "Where are they?" 11:13 Cha-ka says, "Yooo, eram shi me. Yooo, eram shi ma." "Yes, moon that gives. Yes, moon that gives." 11:31 Cha-ka says, "Yooo, eram sha ma." "Yes, Moon-Giver"
11:37 Holly says, "Sa efi eram sha ma?" "What is Moon-Giver?" 11:50 Holly says, "Weni ku oo eram sha ma? Eh?" "They go inside Moon-Giver? (Eh)?" "Eh" is unknown, but presumably a superlative to enhance the implicit answer to the question (yes, they did go inside Moon-Giver). 11:55 Holly says, "Sa ego?" "Where?" 12:08 Holly says, "Yooo, ego aguga?" "Yes, in here?" 12:10 Cha-ka says, "Yooo, yooo." "Yes, yes." 12:25 Cha-ka says, "Ta bu kai eram sha wa." "Ta can open Moon-giver." 12:31 Holly says, "Ta bu?" "Ta can?" 12:31 Cha-ka says, "Yooo." "Yes." 12:53 Ta says, "Ye ku!" "You go!" 13:02 Ta says, "Ye ku." "You go." 13:43 Cha-ka says, "Eram sha wa." "Moon-Giver." 13:46 Holly says, "Wirra o Rica?" "Will and Rick?" 13:49 Cha-ka says, "Yooo, eram sha wa." "Yes, Moon-Giver." 14:04 Holly says, "Mechi. Ta ko chi eram sha wa?" "Please. Will Ta open Moon-Giver?" 14:12-14:31 Ta says, "Anu." "No." 14:36 Ta says, "Anu. Un eno aguga." "No. Not today." Holly translates the second phrase for us. Un=not, Aguga=here, "eno" is unknown. Presumably "eno aguga" somehow means "today". 14:38 Holly says, "Un eno aguga?" "Not today?" 14:43 Holly says, "Sa ometa?" "When?" 14:46 Ta says, "Ta ko nira ye sa ometa." "Ta will tell you when." Holly translates this phrase for us. 14:53 Ta says, "Ye ku ye banda." "You go to your cave." 14:57 Holly says, "Sa ometa?" "How long?" 14:58 Ta says, "Sa ometa ne ko te ba ima misa bisa." "When I come for my big gift." Holly translates this for us as "when I know what gift I want". Sa ometa=when, ko=will, ba=come, ma=gift, misa=my, bisa=big. "Ne" and "te" are unknown. 15:08 Ta says, "Ye ku." "You go." 15:16 Cha-ka says, "Cha-ka ko ku yan ye." "Cha-ka go with you." 15:27 Cha-ka says, "Yooo. Yooo." "Yes. Yes." 15:41 Holly says, "Ye chi toye." "Thank you." 15:45 Cha-ka says, "Cha-ka amura Ari." "Cha-ka friend Ari." 15:52 Holly says, "Ye mika dinda ego aguga?" "Do you want to eat here?" 15:56 Cha-ka says, "Yooo." "Yes." 16:34 Cha-ka says, "Ta te lo ashi ima." ima=gift. The other words are not in any known glossary. 16:44 Ta says, "Odoo mani." "Everything." 16:48 Ta says, "Yooo." "Yes." 16:58 Ta says, "Meni da ku wachi." "We (da) go now." "Da" is unknown. 17:10 Ta says, "Meni ko ye oganza." "We will do your chant." 17:17 Ta says, "Sa ometa edobe ko koji ye ko ku wu." "When the door opens you will go see." 17:26 Holly says, "Holly pu." "I understand." 17:29 The Pakuni chant, "Ometa eram, ometa eram meni ma. Ema risa meni re. Ema bisa, ometa eram, ometa..." ma=give, meni=us, bisa=big, ometa=time, eram=moon. The other words are not in any known glossary. 17:44 Ta says, "Ye ku, ye ku!" "You go, you go!" 22:21 The Pakuni chant, "...eram meni ma. Ema bisa meni re. Ema bisa, ometa eram meni ma. Ema risa meni re. Ema bisa, ometa eram..." ma=give, meni=us, bisa=big, ometa=time, eram=moon. The other words are not in any known glossary.